ISRAEL. PSFK. August 28, 2012. (English) by Laura Feinstein. -Old meets new as a historical park in Israel finds a unique way to ‘retro-fit’ the area with Internet. 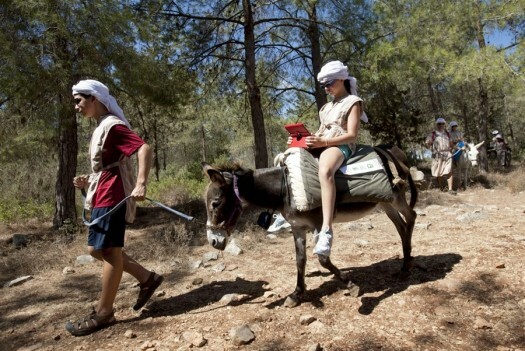 At the historical park of Kifar Kedem in northern Israel, visitors are meant to experience how the area felt in biblical times with 99% accuracy.With guides decked out in biblical robes and headdresses, tourists can get away from the hustle-and-bustle of Tel Aviv and experience the holy land of the Old Testament by riding donkeys through the world famous hills of Galilee. However, should this ride through history prove boring, the park now provides social media and email— via a very anachronistic device around the donkey’s neck. The device, which looks as if it is a feedbag, is actually a Wi-Fi router, allowing guests to instantly share instagrams of their donkey-riding experience. It has been used as a working animal for 5,000 years. There are more than 40 million donkeys in the world . That’s a lot of donkeys! For those looking for something a little more lo-fi, Kifar Kedem also houses a community of Orthodox Jewish families who have created ‘a holistic experience, involving the actual production of household staples such as milk, wool, and bread from scratch.’ Some of their ‘non-social’ activities include a rustic meal at the Tent Restaurant in Shepherd’s Valley and guided spiritual tours of lower Galilee, a route that has been intrinsic to travel in the region for thousands of years.